Pradyumna is in grief due to Gandhari’s curse. He tries his best to fulfil her only wish that can nullify the curse. But the pathway crosses Hell. There are some forces which can dissolve the ethics and righteousness in the people. Pradyumna is trying very hard to keep the ideals of Gita handy for many more years to come. But the combat is not going to be easy. What happens when the evil forces are getting an upper hand? Will Pradyumna be able to save the Yadu clan and his grandson who is there last hope? I really loved the tricky title. There is no resemblance to the title in an easy and plaintive way. It starts making sense when the last few chapters arrive and the mystery which unfolds is of very high quality, no doubt. The essence of the good and bad we do is brought up in a very vast manner. And showing the simple things which is heard from the elders in such a celebrating manner was really delightful. I found Pradyumna leading the story in all manners but as we know that the base is Krishna. I liked the Mor-Pankh, I liked the dark background, which resembled the whole tale in a wider manner but I surely wanted something more, a little bit of Pradyumna maybe, or Maya or maybe a battleground. The cover was serene but a little plain as compare to the story. There were characters in abundance and my God what variety. I felt I have a lot of minds to read and play with. The characters were new for me and they were not at all boring or extra radiant at the same time. They were simple characters with some extra powers and very important tasks in hands to complete. I simply loved Pradyumna for whatever he did and in whatever phase he was stuck. I loved him in the Yamlok, I loved him when he adored Maya, and I loved him when he cried for her, I loved his love for his father, I loved his heroism, and I loved his extra powers. From other major characters I loved Maya of course. She was a true mirror of a woman, she was powerful, supportive and aggressive and not to forget lovable and caring. The part of the book where she summoned women in the courtroom showed her excellence at par. I liked Kali because he was a very strong antagonist and the last speech he gave of course showed that how the evil persists in the world. From the minor characters I loved Ajaya. All the Maya created by him was mysterious and superb. Also I liked, Koka and Vikoka, I loved there powers mainly, Alakshmi and all the illusions she created, Hasmukha and his unmatched friendship and Vikarna for his heroic deeds. There is nothing much to say about the narrative powers of the author. I could travel with the words and feel the fire through the incidents. All the major movements in the story were given a lot of emphasis and the minute detailing with all the names and Godly figures of different phases were shown with utter brilliance. I loved the fact that there were pauses before any major movement too. Loved the chapter names, they were not phrases but a collective abbreviation of what is about to come. Who thought that there was a story even after the Pandavs defeated the Kauravs? After the rage of Bheem I thought that the fire of redemption was all done but some books brings incidents of different dimension altogether. The Secret of God’s Son has touched a magnificent phase of Krishna’s life. It is my first book in the series. Frankly I didn’t even know who Pradyumna and Samba were and after reading the book I didn’t feel like I haven’t even heard of them. 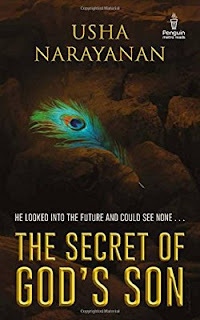 With powerful imageries and a great balance of evil and good the book reached the vantage point with some great accolades in its hand in the form of peerless narration, exuberating characters and a traditional yet fancy tale of a great warrior. In the start of this great saga I was perplexed with all the new names and incidents because I had never heard any of them. I was prepared for reading another Mahabharata in a twisted way but that shore was left long back by the author; she was rowing to reach another end. The mist cleared with the incident of Vikarna’s doom. The aura of this superficial journey of Pradyumna was embossed with pearls. And that was the very point that the book really became engrossing. I really enjoyed the scenes that were portrayed to show Yama’s palace and his workers who were matching the level of fury and rage when one thinks about this ruckus in general. Further I liked how things progressed in a genuine manner and not just for the sake of completion. The pauses which the author took in between the heavy tale to narrate some folklore were very gripping and interesting. The management was crossing the limits of perfection. The middle portion of the book was ecstatic and quite fun to read. There were really dark and mysterious corners in the chapters which were glorifying the story and enhancing the good characters. I knew that with the addition of Kali, the story is about to reach some other tangent. And I was not disappointed. There were drastic changes in the surroundings and the most crucial part was the images which Krishna sees of his old days. It transported me back to the time of Krishna and Yashoda’s mischievous life in Vrindavan. I could feel the folly easily. I could understand the change in times with ease and most of all I could feel the pain of Krishna. There is one more noteworthy fact that the author treated even Shiva and Krishna as simple characters. She hasn’t done any extravagant touch-up here and there to show there mystic powers. There traits as Destroyer and Preserver were shown respectively, but a parallel line drawn by her was never getting intersected by other details. The dialogues exchanged between Balrama and Krishna was really touchy and the minute details hidden behind all that happens thereafter places an extra cherry on everything. War is always the most important part in such stories. The sorcery involved in this particular war was something worth reading. Let it be Pradyumna hearing the conversation of the devils or Maya saving everything here and there or Ajaya’s fiery battle with Alakshmi and not to forget the realization of Pradyumna and the final combat, everything was par excellence. And finally the great long speech by Pradyumna, it felt I am also in the midst of all the people who are disturbed and want some solace. Summing up- The book is something different and totally worth a try. It has everything which the books written today lack. A precise portion of everything is well maintained by the author and I thoroughly enjoyed the new tales of post Mahabharata. • A nice blend of sorcery along with magnificence of Godly images. • The love between Maya and Pradyumna and the last section when he explains the requisite points to Lord Ganesha. No matter you are a mythology lover or not, this book is a must read for literature lovers and also those who are bored of common storylines and mundane messages. Usha Narayanan had a successful career in advertising, radio and corporate communications before becoming a full-time writer. She is the author of several books, including The Madras Mangler, a suspense thriller, and Love, Lies and Layoffs, a light–hearted office romance. 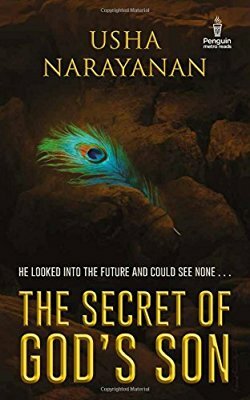 The secret of god’s son is the sequel to her bestselling book, Pradyumna, Son of Krishna, which was published in 2015.